The National Theatre is not like a west end or Broadway theatre because its remit is not about glitzy shows. Instead it brings new and exciting works to the stage and the cream of Britain’s acting talent fall over themselves to be in them. The best way to see the complex is to attend one of the performances. If you book via their own website below or their Box Office phone line, this avoids all booking fees and can save you quite a lot of money! Another option for seeing the theatre complex is to take the Backstage Tour which is absolutely fascinating and we can thoroughly recommend it. You get to see all three theatres and walk on the stages, plus see how the scenery and props are made, and moved around and you see the building in a new light too. You might not find it very attractive from the outside, but once you’ve seen how it functions and why it was designed that way, we actually started to like it! The tours are priced at £8.50 for adults with concessions and family tickets available too (2012 prices). They run up to 6 times a day Monday to Friday at 10.15am, 10.30am, 12.15pm, 12.30pm, 5.15pm and 5.30pm, twice on Saturday and once on a Sunday. Not all tours run on all days and they book up fast, so we recommend you book your tour in advance. Each tour lasts about 1hr 15mins. The theatre complex is part of a collection of arts related buildings on the South Bank of the Thames. 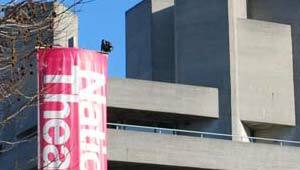 You’ll find the Royal National Theatre next to the Festival Hall.